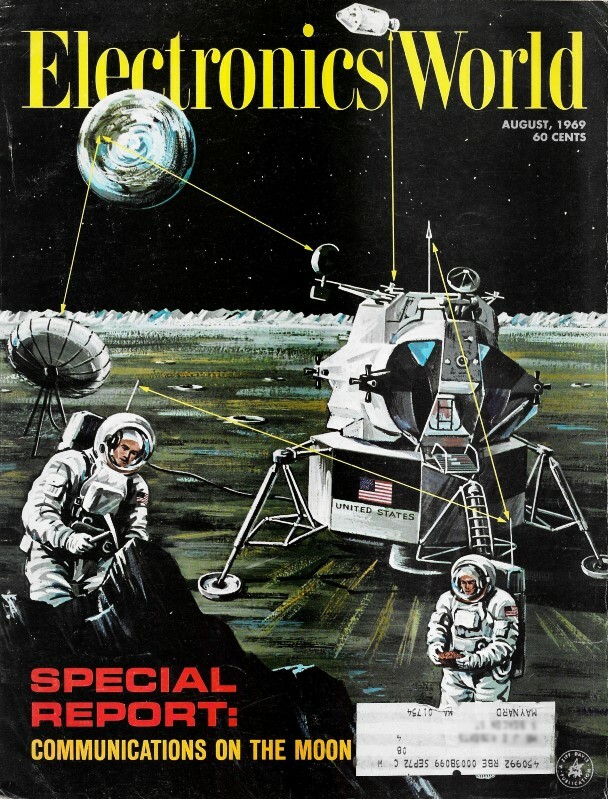 Francis A. Gicca, manager of Raytheon's Space Communications Systems, published a very extensive two-part article in Electronics World magazine in 1969. 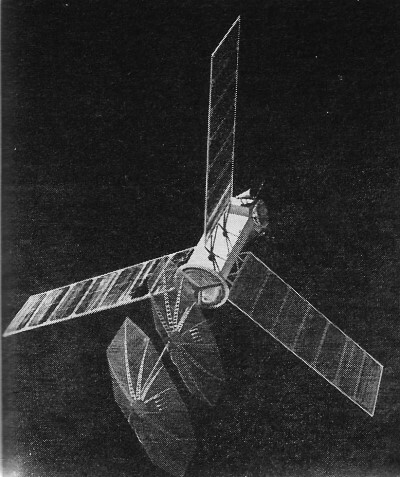 Part 1 covered Score through Intelsat II satellites which launched between from December 1958 and December 1968, respectively, in the July 1969 issue. Part 2 begins with Intelsat III, which commenced operation in September 1968. Rather than reiterating the article's contents, I will offer an anecdote about the altitude used by geostationary satellites, which is 22,300 miles. In the early 1990s, I worked for a few years at COMSAT Laboratories (Communications Satellite Corporation, famous for involvement in both Intelsat and Inmarsat), in Clarksburg, Maryland. The mailing address there was 22300 Comsat Drive. I just looked for my Inmarsat/Comsat project member coffee mug and cannot find it, I'll post a photo of it when I do. By Francis A. Gicca, Manager Space Communications Systems, Raytheon Co.
Inaugurating a real revolution in the field of communications, our successful satellites promise even more startling advances in the near future. Description of the present Intelsat system, along with uses of satellites for aeronautical communications as well as domestic television and for telephone services. 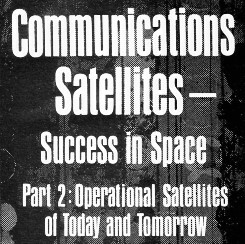 Part 1 of this series traced the early history of communications satellites from Score to Intelsat II. All of these satellites were designed to be experimental but all provided valuable operating experience and confidence in communications satellites. This concluding article will examine the operational satellites of today and tomorrow. Early in 1966 Intelsat awarded a $32-million contract to TRW Systems for six Intelsat III satellites, which were intended to provide the Global System envisioned by the Interim Agreement (see Part 1). Four times as heavy as Early Bird and with five times its capacity (see Table 1), Intelsat III is the first satellite specifically designed to be commercially profitable. For its first operational system, Intelsat attempted to maximize all satellite parameters that would affect revenue; including radiated power, usable bandwidth, capacity, and life. Power radiated at the earth is maximized through the use of a de-spun antenna. 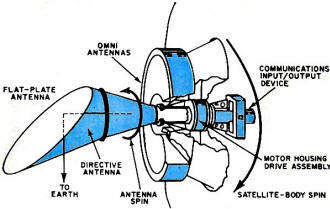 As indicated in Part 1, this approach counter-rotates the antenna beam from the spin-stabilized satellite body thereby keeping the beam pointed at earth. 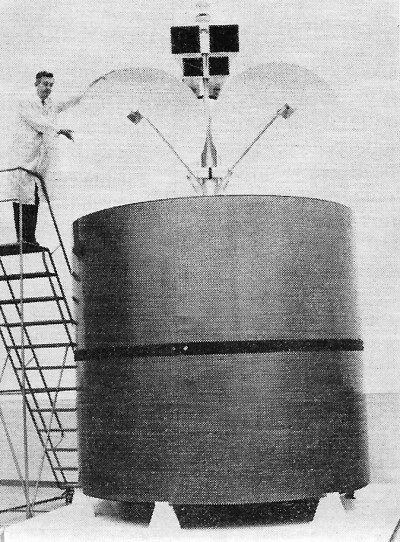 Originally, Intelsat III was to use an electrically de-spun array, but a mechanically de-spun antenna was later substituted (see Fig. 1). As in NASA's experimental ATS-1, the electrical system proved to be lower in effective gain than the mechanical. Experience with OSO, ATS, and other NASA satellites with rotating parts indicated that reliable operation could be expected for more than five years. It was originally feared that the lubricants needed would either freeze or evaporate in space and bearings would seize. Special lubricants and lubricating techniques were developed to operate in the zero-G vacuum environment and have proved very successful. De-spun platforms weighing several hundred pounds are being designed into to day's satellites. Table 1 - Important characteristics of the entire series of Intelsat communications satellites. The total usable bandwidth of Intelsat III is 450 MHz, supplied by two 225-MHz-wide repeaters. This is a utilization of 90% of the 500-MHz bandwidth currently allocated for communications satellite use. The de-spun earth-cover­age antenna and 6-watt traveling-wave-tube (TWT) ampli­fiers produce a radiated power of +22 dBW (158 W) from each repeater. This power and bandwidth are suitable for four TV channels, or two fully loaded carriers with 1200 telephone channels each, or up to 90 multiple-access car­riers each with 24 telephone channels, or any equivalent combination of traffic. While Early Bird was designed for an operating life of 1 1/2 years and Intelsat II for 3 years, Intelsat III has a specified minimum life of 5 years. This represents almost a twenty-fold progressive increase in circuit-years from 1965 to today. This increase has been possible primarily because of the growing confidence in the reliability of communications-satellite components. While Early Bird was designed for a lifetime of only 18 months, it is still operating satisfactorily after four years. The next generation communications satellite (Intelsat IV) will have a projected life of 70,000 circuit-years, a hundred-fold increase over Early Bird. A simplified block diagram of Intelsat III's communications section is shown in Fig. 2. Communications signals from earth stations arrive at the satellite within either of two 225-MHz-wide bands; 5930-6155 MHz or 6195-6420 MHz. This leaves two outer 5-MHz guard bands and a central 40-MHz guard band which also contains redundant satellite-command signals. Fig. 1 - Intelsat III employs a mechanically de-spun antenna. Fig. 2 - Simplified block diagram of the Intelsat III. After reception by the de-spun antenna, a filter-diplexer separates the signals into the two repeater channel bands. Linear r.f. amplification is accomplished by a series of low-noise wide-band tunnel-diode amplifiers (TDA's). An input of -65 dBm to the TDA's will produce a saturated TWT output of 6 watts; a net repeater gain of +103 dB. The signals are then down-converted by 2225 MHz in a wide-band mixer. The two channels that are produced are now in the downlink bands of 3705-3930 MHz and 3970-4195 MHz. The principal r.f. amplification is now accomplished in a cascaded pair of driver power TWT's. After each driver TWT, the redundant command signals are filtered out and removed from the communications channel. 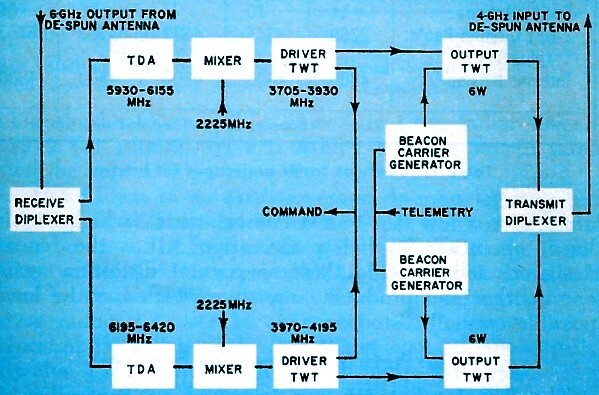 Telemetry signals are phase-modulated onto two beacon signals which are then inserted into the central 40-MHz guard band just, prior to the 6-watt power TWT's. These redundant beacon signals allow the earth-control stations to track the satellite while it is being injected into orbit. After amplification to the 6-watt level, the two repeater channels are recombined in the transmit diplexer and transmitted by the de-spun antenna. The block diagram of Intelsat III is deceptively simple. For the satellite to be efficient its capacity must be limited only by its radiated power and its effective utilization of bandwidth. The former is generally limited by the weight (and thus cost) of the satellite, and the latter by bandwidth allocation constraints (500 MHz at present). This implies that the system cannot economically tolerate any significant degradation of quality by the satellite. This, in turn, means that all forms of repeater distortion must be exceedingly low, typically 56 dB signal-to-distortion ratio, and this is far from simple in such a wide-band repeater. Principal sources of distortion in the repeater include: 1.intelligible crosstalk (any amplitude variations in the repeater convert some of the FM modulations to AM, and the TWT converts these back to FM which intelligibly interfere with the original signal), 2. delay distortion (caused by lack of phase linearity which delays some frequencies more than others, causing a distorted signal), 3. intermodulation between multiple carriers (caused principally by the amplitude non-linearity of the TWT's plus those in the earth stations), and 4. amplitude crosstalk between multiple carriers (multiple carriers produce a composite signal of varying amplitude, the AM-to-PM characteristic of the TWT converts this to an interfering signal). An Intelsat III, with capacity of 1200 voice circuits, is shown here in test chamber. Satellite was successfully launched on Dec. 18, 1968 and placed in synchronous orbit over Atlantic from where it is providing commercial service. The Intelsat III global satellite system. Two (6°W, 31°W) are shown over Atlantic, one (174°E) over Pacific, and one (62.5° E) over Indian Ocean. Two are now in orbit, other two will be orbited shortly. Looming over nearby fields at Cayey, P.R. 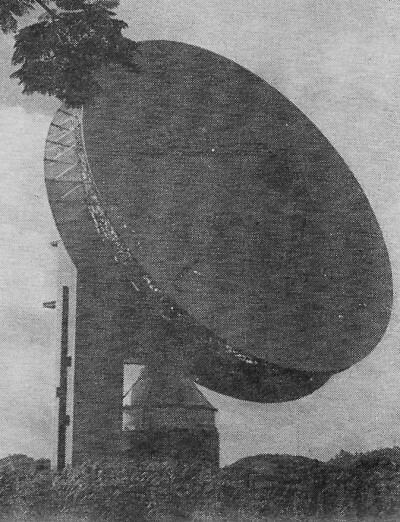 is this 97-ft parabolic antenna for satellite communications. As a result, unless extreme care is taken, all elements of the repeater can produce major distortion. The microwave filters used for diplexing must produce extremely high rejection out-of-band (to eliminate signals that might cause intermodulation and amplitude crosstalk), but must be very flat in-band (to prevent intelligible crosstalk) and linear in phase (to prevent delay distortion). The TWT's have to be efficient (which means saturated operation) but must have a low AM-to-FM characteristic (which requires linear operation far below saturation). It is the repeater designer's job to trade these sources of distortion against one another and produce a repeater which has the lowest possible over-all distortion. 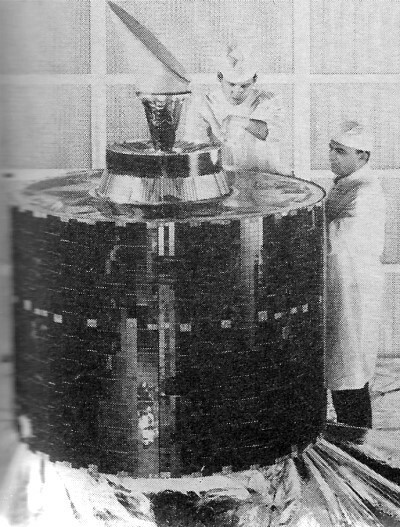 The first Intelsat III was launched on September 18, 1968. Shortly after lift-off the guidance system of the long-tank Delta malfunctioned and the launch vehicle was destroyed by the range safety officer. The second launch took place on December 18, 1968 and successfully placed an Intelsat III at 31° west longitude over the Atlantic. Three more Intelsat III satellites will be at 174° east longitude (Pacific) (already in orbit), 6° west longitude (Atlantic), and 62.5° east longitude (Indian). All are to be in place by the end of this year thus completing the first global system (see Fig. 3). This system of four satellites will be able to handle a maximum of 4800 two-way telephone circuits or sixteen TV transmissions. The standard earth station that completes the Intelsat III global system is an impressive terminal. All standard stations have an antenna at least 85 feet in diameter and many are larger. Typical of the Intelsat earth stations is the new Comsat station at Cayey, Puerto Rico. The antenna, landmark of the station, stands taller than a 10-story building. Total weight of the Cassegrain antenna is about 470 tons. The surface of the reflector, 97 feet in diameter and weighing 45,000 pounds, was designed to an accuracy of better than 50 thousandths of an inch. The antenna and receiver were verified to meet the 40.7-dB gain-temperature sensitivity requirement by listening to the known radio emissions of the star Cassiopeia A. To meet the required receiver noise temperature of 50° K, liquid-helium-cooled parametric amplifiers are housed in an equipment room behind the reflector. In operation, the earth station tracks any small motions of the satellite to 0.04°, using an auto track system which is locked to the satellite beacon. The Cayey station is one of six in the United States; Andover, Maine; Brewster Flat, Washington; Paumalu, Hawaii; Jamesburg, California; and Etam, West Virginia. By the end of this year 44 earth stations are expected to be in operation. By 1972, the number is expected to rise to 86. If these stations should each transmit only 100 telephone calls through the satellite, the capacity of all Intelsat III satellites would be exceeded by 80%. 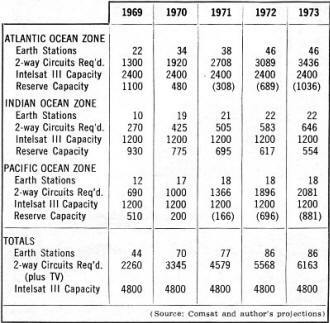 Because of the great expansion in the number of earth stations, it became clear early in 1967, two years before the first launch of Intelsat III, that the satellite's capacity probably would not be sufficient to meet eventual traffic demands. Thus, on March 23, 1967 two study contracts were awarded to investigate an advanced global satellite over three times as heavy as Intelsat III and capable of multiple communications missions, including domestic and mobile communications as well as international traffic. Two types of stabilization were studied for this 2000-pound Multi-Purpose satellite; the familiar spin stabilization and a fully stationary satellite approach. In the latter, the vehicle is stabilized by an internally spinning inertia wheel and the satellite body is stationary. In effect, the entire satellite is "de-spun" with the internal inertia wheel supplying the necessary gyroscopic stability. This approach is interesting because all moving parts are in a sealed inertia wheel case and thus should be more reliable. The antenna and repeater are rigidly connected to the rest of the satellite thereby avoiding slip rings and power transfer joints, and solar paddles, which are pointed at the sun to increase the communications power available, can be used. Although Intelsat eventually decided this approach had too many technical risks for immediate commercial use, it is probable that future satellites will be fully stabilized. Europe is presently developing an experimental communications satellite, called Symphonie, which will use the inertia-wheel stabilization approach. Table 2 - Telephone traffic projections for Intelsat. Because of the Multi-Purpose satellite's great weight, it became possible, perhaps for the first time, to seriously consider how this weight could be utilized to maximize the communications capacity of the satellite. Previous satellites were weight-limited to the point where such optimization was really not possible. In retrospect, a principal deficiency of the Intelsat III design lies in its extremely wide repeater bandwidths for multiple access. Since multiple users must therefore share the same repeater, the TWT must be operated far below saturation to avoid distortions previously mentioned. This, in turn, is an inefficient use of the satellite's power and causes serious reduction of total capacity. Another disadvantage of wide bandwidths is the requirement that each earth station accurately control the power that it sends to the satellite. Since a satellite's repeater power will be distributed among all users in proportion to the strength of the received signals, an improperly large signal from one earth station can capture all the repeater's power. To avoid this situation, each station must accurately monitor its power and control it in proportion to its traffic needs. This is both difficult and impractical. Experience with Intelsat III has shown that stations cannot easily maintain the required accuracy. These considerations suggest that the available bandwidth should be divided into many little repeater bands and each earth station assigned its own exclusive repeater and saturated TWT. This is not entirely possible since each band must be set at least as wide as the widest bandwidth signal to be carried and it is likely that several users might still wish to multiple-access that band with small traffic. Still, this approach is a great improvement. As might be expected, the widest bandwidth user is television, requiring a band of about 40 MHz in the Multi-Purpose configuration. Twelve such bands fill the available 500-MHz bandwidth. Twelve 8-watt or 12-watt TWT's would completely use the 2000 pounds available, depending upon whether complete electronic redundancy is used or not. Since the capacity of the Multi-Purpose satellite is affected more by bandwidth limitations than power (it is bandwidth-limited), the lower power redundant configuration was chosen because of the significant increase in circuit-years for this choice (a lifetime of 7 years). With a repeater bandwidth of 40 MHz, 8-watt power, and earth-coverage antenna, each of the 12 repeaters can handle 1800 telephone channels or one TV channel. Fig. 3. The 1970 Intelsat III global system will consist of four satellites and a large number of ground stations. This entire system will be able to handle a maximum of 4800 two-way telephone circuits or 16 TV transmissions. By early 1968 international traffic projections were similar to those shown in Table 2. 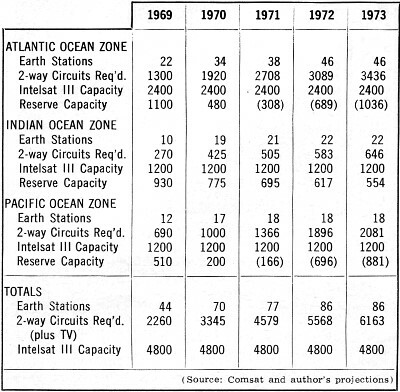 It was becoming clear that by 1971 Intelsat III's capacity in the Atlantic and Pacific would be exceeded. Furthermore, should any satellite fail, the system would be in serious trouble; adequate Intelsat III in-orbit reserve capacity did not exist and Intelsat I and II would be well beyond their design lives. After first considering the purchase of additional improved Intelsat III satellites (Intelsat III 1/2), it was decided to proceed with the Multi-Purpose international design, which was named Intelsat IV. A $72-million contract for four of these giant satellites was awarded to Hughes Aircraft last fall with the first two launches scheduled for early 1971 (Atlantic and Pacific). The third satellite will be placed over the Indian Ocean in 1972 (at Intelsat III end-of-life) and the fourth satellite will be kept as a spare. In addition to its earth-coverage de-spun antenna beam, Intelsat IV will also have two 4.5° spot transmit beams that can be aimed at high traffic points on the earth. Eight of the twelve 40-MHz repeaters (36-MHz usable bandwidth) can be connected to the spot beams, increasing their effective radiated power 15 times. The maximum capacity of Intelsat IV will be over 10,000 two-way telephone calls or twelve TV channels with greatly improved access. The Multi-Purpose study also was the first to investigate the use of satellites to communicate with aircraft. At present, transatlantic flights are out of range of shore-based v.h.f. communications for about 90 minutes. It is projected that during this year's August transatlantic peak, 85 aircraft will simultaneously occupy this 1000-mile-long "radio-silence" corridor in the North Atlantic. At about the same time, 40 aircraft will be out of radio contact over the Pacific as will 10 aircraft over the Indian Ocean. Artist's concept of fully stationary Multi-Purpose communications satellite. Large antennas provide steerable spot beams for high-traffic areas. Entire vehicle remains pointed at earth at all times. Mockup of giant 2000-lb Intelsat IV, scheduled for service in 1970's. It has capacity of up to 10,000 telephone calls or 12 color-TV broadcasts. 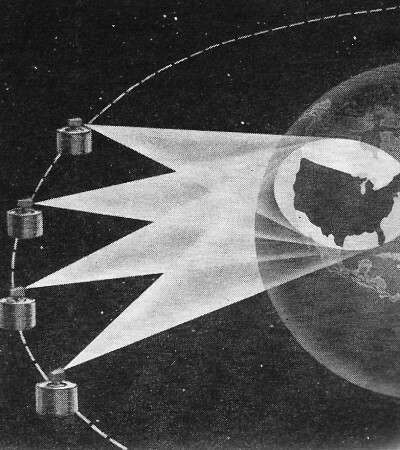 Several proposals have been made for the use of satellites for U.S. domestic distribution of TV and telephone calls. Satellites would either blanket U.S., as shown, or use spot beams to provide time-zone coverage. This lack of communications is the principal reason for a required lateral separation of 120 miles between aircraft over the Atlantic. The restriction is expensive to the airlines because it prevents them from operating flights when passengers would like to fly, and forces them to schedule to meet the separation requirement. In ten years the transatlantic peak in the silent corridor is expected to exceed 150 aircraft and will consist of a mix of supersonic, jumbo, and conventional jets. To make this high density possible, lateral separation must be reduced to below 60 miles. If a recommended minimum safety criterion of less than one collision in 100 million flights (one incident per thousand years) is to be met for this separation, the position of each aircraft in the corridor must be known to better than 15 miles. Such accuracy requires that each aircraft be under surveillance at all times, and this can he done only by satellites. Simplest would be an aeronautical comsat (aerosat ) that interrogates aircraft for position information as well as air traffic control communications. An advanced approach would also verify aircraft position, using a ranging code. 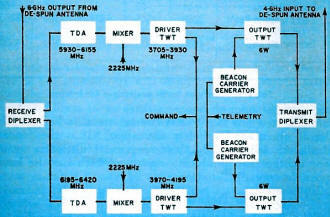 From the airlines' point of view, the present 118-136 MHz v.h.f. aeronautical band would be ideal for such an aerosat since it would mean the least change. The v.h.f. experiments between ATS-1 and test aircraft over the Pacific, and Air Force experiments with LES have proved that a v.h.f. aerosat can be built today. The principal obstacle is that v.h.f. is not allocated for satellite use and government officials are reluctant to risk further possible interference in this congested band. A possible alternative is the use of the aeronautical L-band (1.540-1660 MHz) and the FCC has recommended that this band be used by aerosats on a shared basis. Since aircraft equipment is not currently available at L-band and practical aircraft antennas do not exist, airlines have not been anxious to proceed. Instead, the airlines are arguing internationally that a portion of the v.h.f. band should be allocated for this service and that L-band should be developed gradually. In any event, because of the urgent need, it is probable that some form of aerosat will be under development before 1970. But perhaps the most significant portion of the Multi-Purpose study was that concerned with the design of domestic comsats. If comsats have had such an impact on international communications, why not use such satellites for domestic transcontinental traffic? It all started in 1966 with FCC Docket 16495 which was established after ABC and the Ford Foundation both filed for authority to orbit television-relay satellites. ABC applied on the basis of cost savings to distribute its TV programs, while the Ford Foundation argued that similar savings could help support educational TV. These applications were quickly followed by others including two from Comsat and AT&T, who argued that any domestic satellite should be designed for both TV and telephony. All proposals are still being evaluated by the government, for as FCC Chairman Hyde has stated, "No Commission task is more challenging ... than the determinations to be made concerning the proposed use of satellites for domestic purposes." The potential impact of these proposals also caused President Johnson in 1967 to establish a Presidential Task Force to review the entire national communications policy. This task force, under Presidential advisor Eugene Rostow, made its unreleased recommendations to President Johnson last December and it is likely that major reforms in the Communications Act of 1934 are being considered. Although the value of distributing transcontinental TV signals via satellite is clear, the domestic distribution of telephone signals will ultimately prove to be a most significant development. At the moment, a domestic satellite would provide better transmission quality than any ground link longer than about 1500 miles. This is so because a satellite's signal quality is essentially independent of distance, while a terrestrial link deteriorates directly with distance. Further, since satellite cost compares favorably with ground links, there is little reason to develop new long-distance microwave ground links. However, traffic projections for the early 1970's show a need for additional transcontinental capacity. All these factors favor the early development of a domestic TV/telephony satellite. In time, this situation is likely to produce more reliance on satellites and less on ground links. 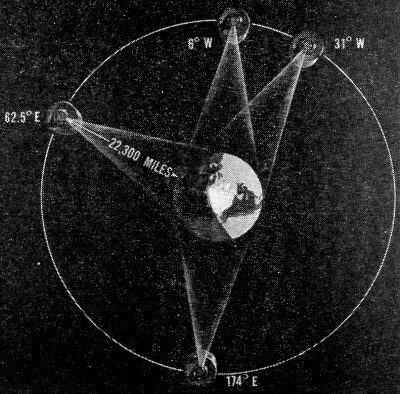 By the early 1980's, large-capacity domestic satellites could be handling messages over distances beyond 500 miles to open a new generation of inexpensive public communications. 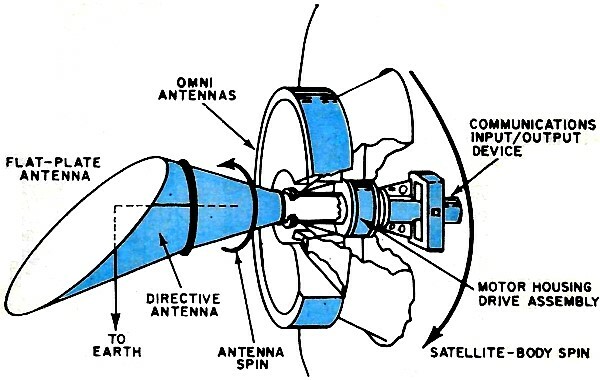 In December, 1966 Comsat proposed to begin domestic service with a Pilot satellite designed to provide practical operational experience prior to the establishment of a full system. The Pilot satellite is essentially a 12-channel Intelsat IV satellite with the earth and spot beams replaced by a 3.5° X 7.5° beam that blankets the U.S. The Pilot system would employ two such satellites, two east-coast and two west-coast Intelsat-quality access stations, and about 30 midwest receive-only TV terminals (32-foot antennas). Interest in domestic satellites is not confined to the United States. France has studied a domestic satellite (Saros ) to connect continental France to colonies in the Caribbean and Africa. It has also studied a radio-TV satellite to link France and French-speaking Quebec in Canada. West Germany has studied a domestic satellite (Olympia) and proposed its use for TV distribution of the German Olympics in 1972. France and Germany agreed last year to join forces and construct a common satellite (Symphonie) to accomplish the previous Saros/Olympia missions. This satellite is under construction and scheduled for launch by 1972. Canada has just concluded two studies of a domestic satellite to help it distribute radio, TV, and telephony to previously isolated communities in the northern Provinces. India and Brazil are also considering domestic systems. Even with its relatively small area, Japan has studied the development of its own system, as has the State of California. The operational successor to the Pilot satellite is likely to employ four 2° spot beams to illuminate the four U.S. time zones for more versatile TV distribution. This raises the interesting possibility of re-using the same 500-MHz down-link frequencies in every other time zone. The selectivity of the spot beams would keep these same frequency signals from interfering with each other. This would essentially double the TV capacity of the bandwidth-limited satellite to 20-24 channels. Since most programs originate at either Los Angeles or New York, the problem is how to transmit up to 20-24 channels on the single available 500-MHz up-link band. This number of channels is required on fall weekends when the ABC-CBS­NBC-NET networks are telecasting different programs in each time zone plus regional football games. It is apparent that the above problem is a symptom of insufficient available bandwidth. At the end of next year, the ITU plans to convene a World Administrative Radio Conference (WARC) which will consider, among other things, the allocation of additional frequencies for communications satellite use. Table 3 shows present and proposed frequency assignments. The two 500-MHz bands currently allocated at 4 and 6 GHz are shared with terrestrial microwave links. This has led to specific restrictions on satellite power levels so that they will not interfere with established microwave links. The same situation is true for the military band, but the problem here is not as severe since the traffic needs are considerably less. Table 3 - Present and proposed frequency assignments for comsats. In preparation for the WARC, the FCC recently recommended additional assignment of two 20-MHz bands at L-band for mobile aerosat use, and two additional new 1000-MHz bands exclusively for communications satellite use. Although the new point-to-point bands would triple the currently available bandwidth, the new frequencies are in the millimeter band where they are severely attenuated by rain. For reliable operation, several widely spaced redundant earth stations might be required at each site so that one would always have favorable propagation. This is expensive and so Comsat would like, and has requested, the additional allocation of shared frequencies at X-band on an "as available" basis. Comsat has also requested that the v.h.f. aeronautical and marine bands be shared with an aerosat. Although there exists justifiable economic reluctance to begin development of a millimeter band for communications satellites, the use of this band is inevitable. Communications satellites have become popular candidates for many domestic applications and the pressure for exclusive frequencies for advanced domestic applications is great. Only in the millimeter region is exclusive allocation possible. Not only has this portion of the spectrum room for a fantastic amount of communications, it also offers the hope of extremely inexpensive world-wide communications. By the turn of the century it is quite likely that most industries and many homes will have direct millimeter-wave access to communications satellites. This will not only allow allow most instant global connections, but will also allow the centralization of facilities that are now too expensive to duplicate at several locations. It will start the era of centralized world libraries with computer-aided searching and abstracting, global facsimile transmission, automated medical diagnosis using centralized case storages, home tele-shopping with individual televiewers and banking units that debit our account when we place an order, as well as direct communications between computers to form fantastic control systems. Also operating will be huge broadcast satellites that can transmit radio and TV programs directly into the home. Considering what communications satellites have achieved in the past ten years, the only real question is whether it will take as long as 30 years for this next revolution to happen. The author would like to thank the Communications Satellite Corporation, NASA, and the U.S. Air Force for their kind help in preparing these articles..